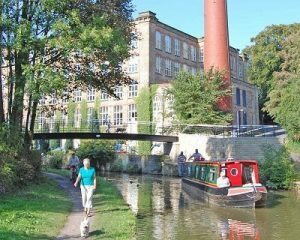 The Macclesfield Canal brought trade in Bollington to life, providing for the first time a means of getting raw materials into the town and finished products out in bulk and quickly – only a one day journey to/from Manchester. It also provided the incentive to build the two great mills on its banks, Clarence and Adelphi. The first sod was cut at Bollington, though we don’t know where, but probably at Bollington Wharf on Grimshaw Lane, opposite Adelphi Mill, in 1825. 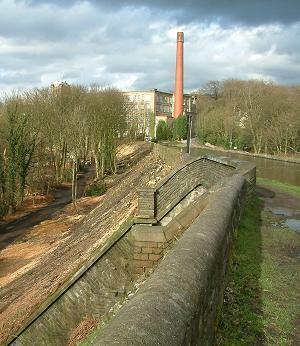 The canal was finally opened on 9th November 1831 after the difficulties of its construction at Bollington, with the completion of the huge Palmerston Street embankment and aqueduct (left), the two largest, and most troublesome, engineering structures on the entire canal. Bollington mill owner Philip Antrobus at the time lived in the house known as Rookery, rented from Philip Antrobus. The schedule to an 1832 Act of Parliament relating to Antrobus’s Will shows that Rookery was leased to ‘Willm Crossley’. It is thought that this was probably the same William Crosley (he spelled it with one or two ss) who was the engineer to the Macclesfield Canal Company – the chap in charge of construction of the canal. This probability is confirmed by items in The New Monthly Magazine 1833 and the Gloucester Journal 27th October 1832 which refer to Crossley as residing at Bollington. 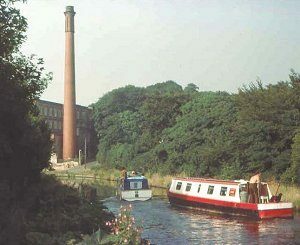 Crosley’s name is usually spelt with one s, as it is throughout the Macclesfield Canal Company’s minutes and other documents. However, the Macclesfield Canal Society historian and archivist, Graham Cousins, has discovered a document signed by Crossley with two ss. So you pay’s your money and take’s your choice! The route for the Macclesfield canal was originally surveyed by Thomas Telford, the pre-eminent civil engineer of his day – indeed, he was one of the first people to be addressed as a civil engineer, and in 1820 he became the first president of the Institution of Civil Engineers . Telford used his survey to prepare a parliamentary Bill and presented it at Westminster to gain approval for construction. The necessary Act was obtained in 1824 and construction began in 1825 under the management of William Crosley. Significantly, Crosley wasn’t keen on several aspects of Telford’s route, and he altered it, reducing the length of the canal by several miles. He achieved this by eliminating several excursions around the hills and valleys, replacing them by embankments and aqueducts across the valleys and cuttings through the hills. His design was much more adventurous in engineering terms than the original Telford design which, frankly, was for a rather old-fashioned contour canal. This change in design was most significant at Bollington where the canal was to cross the river Dean. Today we see a large stone embankment and a very fine aqueduct crossing Palmerston Street. If Telford’s plan had been executed Bollington would be a very different place today. From Clarence mill the canal would have crossed Clarence Road, gone in front of where Rock Bank house is today, turned sharp left at Beeston Brow, and would have been cut along the hillside where Beeston quarry is today, across Shrigley Road and past the top side of Oak Bank mill pond. At some point in Sowcar meadow it would have turned around and headed down the south side of the mill pond (through where Willowbank Drive is today), across Ingersley Road, Silver Street and Church Street, around the churchyard and back across Church Street, Nancy View, and through where the houses line Ingersley Vale probably as far as Rainow mill (the green shed by Mill Cottages). Here it would turn sharp right and head back along the other side of the valley passing across the fields to cross Lord Street, through Cumberland Drive and Dean Close, across High Street above the turn, through Fernbank Drive, then along the hillside behind the cottages in Water Street to re-join the present canal at Hurst Lane wharf. It is interesting to note that neither Beeston quarry nor Hurst quarry (behind Water Street) could have been excavated if the canal had followed this route. On the other hand, those quarries could have taken a different shape with a very useful means of transport available to them if the canal had been built on this route. And consider the number of street crossings – there could have been a lot of canal bridges in the town! A further aspect of Telford’s plan was to build a reservoir in Hedgrow valley. Just imagine, that green a pleasant valley flooded and with a sailing club today! It would have been very popular. The embankment beside Palmerston Street aqueduct, pictured above is quite unique in its construction. It is built entirely of rock, the most readily available material around here. There is believed to be no other on the British waterway network like it. Most embankments were built mainly of earth, usually that which had been excavated from nearby cuttings. Earth embankments tend to have flatter profiles with a maximum slope of 2:1 (33%). Building with rock enables a steeper sided profile and ours is 1:1 (50% or 45deg). There is one small section – in the bottom left corner of the picture – that has additional material piled on. This is thought to have been required as a result of spreading during construction. More material was stacked here in 2009 when the pedestrian bridge was built adjacent to Clarence mill. The ground beneath was very soft and while one would expect that the soft material under the embankment was removed down to rock level the ground fell away towards the Gnathole (original name for the recreation ground) so leaving that side without adequate support. And there is a further unusual feature associated with the canal at this point. The River Dean naturally flows through this valley. If you imagine the valley at this point without the canal embankment or aqueduct you will realise that it is a very narrow gap between the hills on either side. Originally the river passed across the war memorial garden, through the narrow gap, and spread out in the area that is now the recreation ground. All the surrounding ground was very boggy, not at all suitable for building such a huge structure across the valley. The solution was to remove the river and drain and dry out the ground. The only way to do this was to move the river onto a new course and put it through a tunnel. This runs from behind the first few cottages in Water Street, under the canal, under Palmerston Street, and exiting in the recreation ground. On 29th February 1912 there was a very serious breach of the canal at Kerridge almost opposite the wharf and dry dock. This event is fully described on another page. A beautiful model has been made by Keith Scammell of the wharf at Kerridge as it is believed to have been in about 1870. Have a look at this on another page. 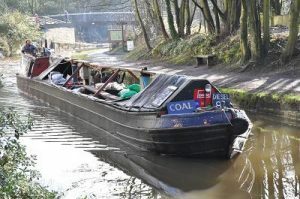 Full details of the canal today can be found at the Macclesfield Canal web site . That site includes extensive historical information .